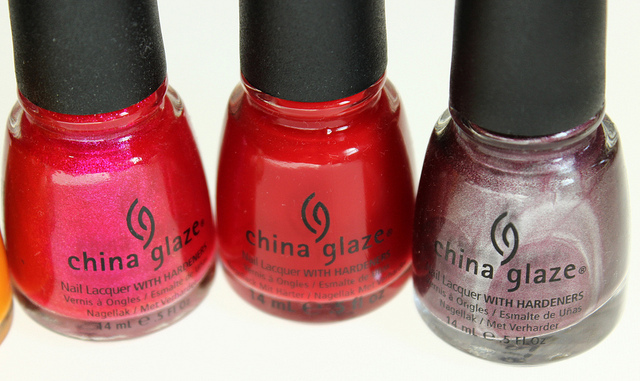 Back in April, I attended IMATS here in New York City, and these five China Glaze nail colors were among the goodies I brought home with me from the event. There was an awesome sale going on at the booth I purchased these nail colors from, so of course I had to indulge in a few shades. Most in part because I had never tried China Glaze nail colors before, so it was a good a time as any to see how they would work out for me. Check out some swatches, and my thoughts after the jump! White Cap: Light golden shimmers embedded in a transparent base. When I first laid eyes on White Cap, I immediately thought about how gorgeous it would look, layered over a solid color. I think this works well with practically any color, but I think it looks particularly stunning over a black cream. I think I found what is probably going to be one of my favorite fall/winter nail combinations. The twinkling shimmers are smooth to the touch, and one coat is more than sufficient for complete shimmer saturation. Papaya Punch: Orange cream. I love this shade. It's so perfect for these warmer months, and it makes a fabulous pedi color. The first coat went on a bit streaky and patchy, but the addition of a second one eliminated those issues and provided opaque and smooth coverage. 108 Degrees: Fuchsia pink with fine shimmers. This a very pretty pink. I just love the sparkling shimmer bits, which add a nice dimension to the color. The formula on this one is on the thinner side, so it does take about 2-3 coats for an opaque coverage. Poinsettia: Bright red cream. I probably didn't need another red cream in my collection. But I can never seem to get enough of this classic hue. The first coat applied evenly, but rather sheer. So two coats are needed for complete coverage. This was my favorite, in terms of formula. Joy: Frosty metallic plum, with silver micro shimmers. I know that I am going to have a lot of fun with joy during the fall/winter months, which is when I frequently rock shades like this one. The foiled, jewel finish gives off such a gorgeous dimensional look to the nails. One can achieve an opaque saturation with just one coat. Out of habit though, I always apply two for good measure. I think it's worth noting that because of the finish brush strokes are a little visible on the nails. But luckily, it's not super noticeable. I found that the formulas on these nail colors varied. Some were thinner, while others were a little creamier. They were all easy to work with, nonetheless. 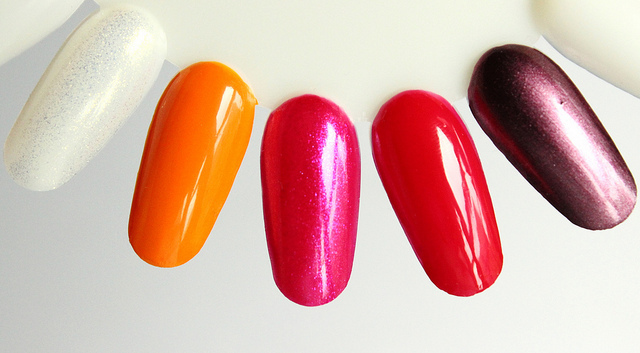 I love how how the nail brush was easy to use, and each of these quickly dried to a beautiful shiny, glossy finish. 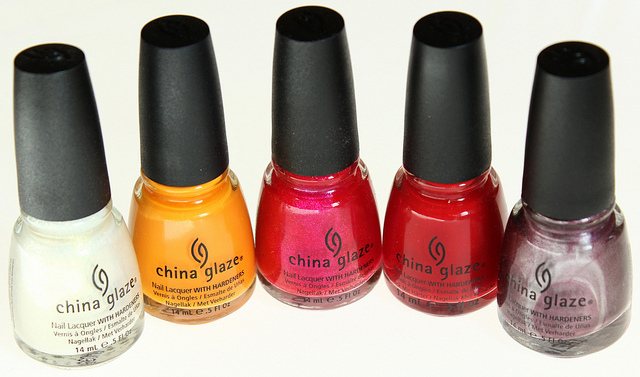 I haven't tested all of these for wear time, but I did sport papaya Punch on my toes, and it really hung on. Let's just say that with the addition of a lasting top coat, chips didn't stand a chance. 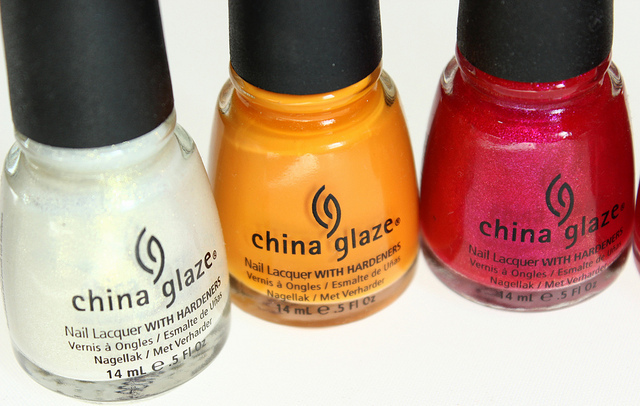 Which are your favorite China Glaze shades?